KISSlicer 1.6: Fractional Loops - Lunacy or Brilliance? Fractional loops!!? "What the heck is that?" you might be asking yourself. You're in luck, I'm going to tell you what it is and explain why this is a brilliant and powerful new feature unique to KISSlicer 1.6! 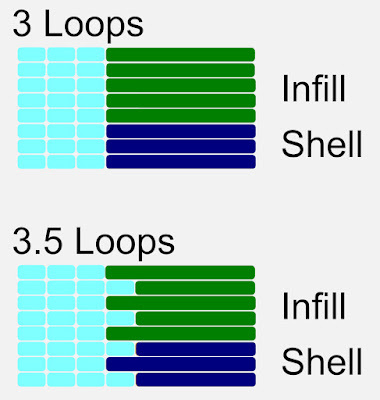 Fractional loops - especially .5 fractional loops - is such a useful feature, all of my default styles have .5 fractional loops. 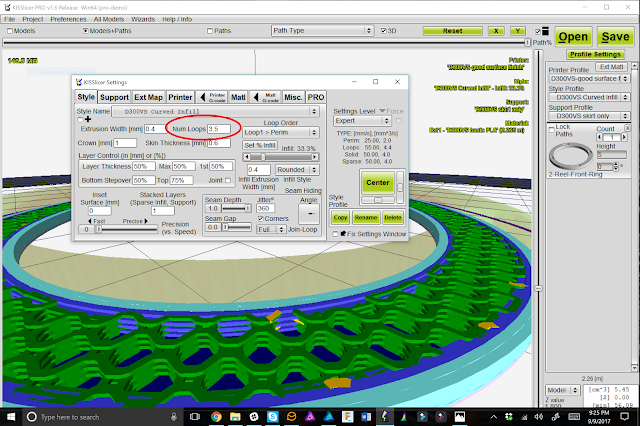 Now you know about this great new KISS 1.6 feature and how it can create stronger printed parts. It's a brilliant feature, use it with your prints! Infill overlap actually increases the amount of filament that needs to be squeezed into the same volume. Fractional infill does not. For example, if you used a 50% infill overlap - depending on slicer of course since they each handle this differently - you end up with two times more filament in the area of overlap. This excess filament can create other issues - especially on the first layer and top surfaces. The infill overlap feature was originailly intended to compensate for printer mechanical issues and differences and hysterysis in an effort to reduce/eliminate gaps. In a perfect world, the infill would perfectly connect right at the perimeter interface but mechanical slop and a number of other factors prevent this. KISS supports infill overlap too, for exactly this reason. The fractional loops feature provides a more consistent and reproduceable mechanism for increasing the strength of this critical loop-infill interface that works over all infill percentages. 1 comment to ''KISSlicer 1.6: Fractional Loops - Lunacy or Brilliance?" Slic3r supports this as well since 2011 or so. However, I love and use KisSlicer!